Chacodog.com donates $1 from each order to worthy causes. We have donated $15400 to date. Erma Arviso is a Navajo woman who strings turquoise and creates "antiqued" Sterling beads as perfect accompaniment to pendants with large bales. This is a string of machine-made Sterling beads which have been "antiqued" by Erma to give them a matte finish and an "old pawn" patina. 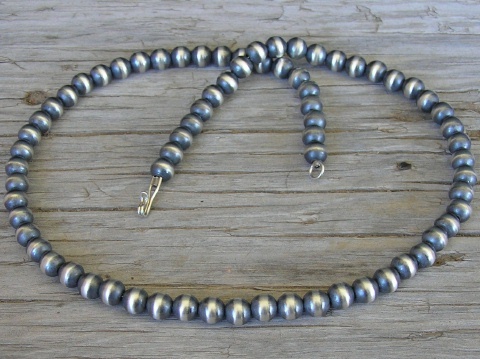 This process entails oxidizing the loose beads, then rubbing them with fine steel wool to give them a brushed finish. After preparing the beads, they were strung on braided stainless steel wire for durability. This strand of beads consists of round beads which are 8 millimeters in diameter.